Your coasters can catch every eye at your next tea party. 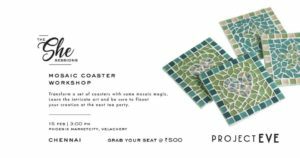 Work with mosaic tile shards and grouting techniques, and deck up a set of coasters to take back with you. Book your spot now: http://bit.ly/2Bq3oh3 Limited capacity event. Materials provided. Tickets once purchased are non-refundable.